Clear Diamond produce a range of Anti-Bacterial Screens, Display Protection films and Privacy Protection film for both retail and commercial applications. Clear Diamond is distributed in Australia by Optiseal specialists in butyl tapes, focused on high performance products for Building and Construction, Rural and Agriculture, Transport, Sign Industry, DIY and Recreation applications. Optiseal supply the highest quality products available, with first class service and technical support. Clear Diamond products are produced using the highest quality materials at the Hi-Bond manufacturing facility in Corby, UK utilising the latest technology to create premium quality products at reasonable prices. 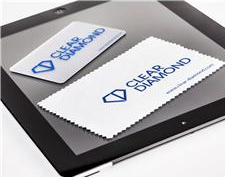 Clear Diamond produce an extensive range of high quality protection films for the most popular mobile phones (iPhone 5, Galaxy S3, Nokia Lumia, Sony Xperia), tablets (iPad , Ipad Mini, Nexus 7 and 10, Playbook, Galaxy Tab), e-readers (Kindle Fire and Kindle HD), MP3 Players (iPod) and touch-screen PCs. Our protection films offer the highest standards of protection for your device, our Hardcoat protection film is Anti-Scratch, Anti Bacterial (lasts up to 12 months) and optically clear. While our Anti Glare protection film is still Anti Scratch and Anti Bacterial it also adds Anti Glare and Anti Finger print protection to help keep your device clean. We can also produce Clear Diamond screen protection films to custom sizes, plus our new OneView Privacy Protection films are also available in standard and custom sizes, please just contact us with your requirements and specification and we will get back to you with the perfect solution. We also manufacture films for manufacturers of phones, PCs, touchscreens and other devices for use in the manufacturing processes and shipping. PROTECT YOUR SCREEN AND YOURSELF - contact Optiseal on (03) 9587 6022.